Comments: The demise of this bird is a sad chapter in natural history. The lesson from the Eskimo curlew is simply that species considered common and numerous can become extinct or rare in a very short time span. 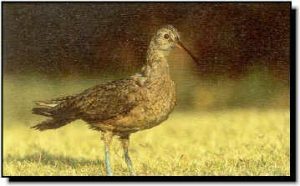 The Eskimo curlew population crash mirrors the passenger pigeon. Both were abundant but neither could withstand the human pressures of habitat change and unregulated market hunting of the late 1800s. Eskimo curlews traveled across Kansas in huge flocks during spring migration. One report from Nebraska estimated a resting migratory flock covered 40-50 acres. The last year a specimen was collected from Kansas was 1891, and the last year it was sold by market gunners in Kansas was 1902. The Eskimo curlew was thought to be totally gone by 1940 but a few periodic sightings since then have kept them from being declared extinct.